It was a day of celebration in May for one local church community when the Coptic Pope Tawadros II consecrated their new church in Hounslow. His Holiness Pope Tawadros II, 118th Pope of Alexandria and Patriarch of the See of Saint Mark, was in the UK for a weeklong pastoral visit during which he met the Queen and Prince Charles and was received at Lambeth Palace by Justin Welby, Archbishop of Canterbury. In Hounslow he was accompanied by Bishop Angaelos and a number of bishops from Egypt for the 8am service. The Pope was warmly greeted by the congregation. The male choir sang joyfully and the ladies in the congregation ululated enthusiastically at key moments in the service. The Pope and other clergy spread the holy oil on the altar in the sanctuary and each icon was anointed with a long roller. Ruth Cadbury, (parliamentary candidate and incumbent) and Charanjit Ajit Singh, Chair of the Interfaith Group made brief speeches of congratulations. The church has already made a contribution to the local area and weekly provides food for homeless people. It was the one of the venues for the HFOF Walk of Peace and Friendship in 2016. We welcome Father Morkos and the Coptic congregation to the faith community in Hounslow and wish the church every success in their work. Faith groups pledge to build bridges. “Hounslow Friends of Faith (HFOF) at their meeting on 30 June 2016 were saddened to note that following the result of the Referendum to leave the European Union incidents of targeted abuse have created concerns amongst our diverse faith and minority ethnic communities. This abuse and hostility is entirely at odds with the values of tolerance, valuing of diversity, and mutual respect, which we share. We wish to extend our sympathy and support to any who have been targeted. 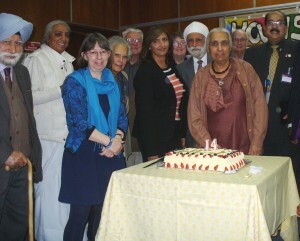 A well attended meeting celebrated 14 years of joint working for the community at Hounslow Civic Centre this week. A specially made cake was cut to mark the occasion. Hounslow Friends of Faith held the meeting, one of two events being held for Inter Faith Week, to look at what members of faith communities can do for peace both globally and locally. Millius Palawiya, Director of the Fellowship of Reconciliation gave a stimulating talk. He encouraged participants to be truthful to their own scriptures and to speak truth to power. The aims of modern war are now unobtainable. We should highlight alternatives to armed intervention to our members of parliament. People should be willing to create friendships with those of other faiths to avoid conflicts and misunderstanding. Achievements so far of Hounslow Friends of Faith were reviewed. Activities include service projects, consultation, liaison and bridge building between communities and education about faiths. Together these are a valuable contribution to society. The training course for volunteers interested in supporting people at home at the end of their lives has now come to an end. Five students completed the course. They are being registered as volunteers with the chaplaincy based at West Middlesex Hospital and expect to start work soon. On Friday 13 June St Paul’s Church Hounslow West are hosting Dr Kiran Martin, Padma Shri, who has been recognised by the President of India for her charity Asha and her outstanding contribution to the development and social improvement of the conditions of slum dwellers in New Delhi, especially children. Her achievements over the last 25 years have been astounding – she now serves over 450,000 people living in slums in this major city! The evening is being hosted at St Paul’s Church, Bath Road, where members would love to welcome many friends, old and new from around the Hounslow community to hear about the work. Members of St Paul’s are hoping to visit Delhi soon to see some of the projects and make a link with Hounslow.